Hometown: I’ve had the blessing to have lived in many places all over the U.S., but I consider Laramie, Wyoming to be my home now. Why did you decide to go on the Yanayacu Research Trip? As Scott Shaw’s graduate student, my research focuses on new species of parasitoid wasps from the North-Eastern Andes. So, I have gone to Yanayacu twice now and am in the process of planning my next research trip there. What was the most important thing you learned? Wow. It is difficult to simply name “the most important” thing that I’ve learned because I have learned so much. Academically, I have lived in my research animal’s environment, which teaches you more than what you can gleam from a book. Personally, this has given me the chance to experience the wonders of Ecuador, both the people and places, which keeps pulling me back for more. How has this experience changed you? 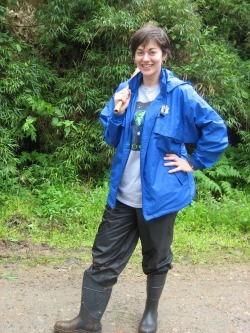 My research trips to Yanayacu have made me more confident as an entomologist and as an expert in my field. I’ve also met wonderful people in conjunction with trips to Yanayacu, be they teachers, undergraduate students, employees of the research station, fellow researchers...the list goes on! Getting to know these people has had a profound, positive effect on me. What are your plans for the future? I am planning on finishing my Master’s degree in Entomology in May of 2010 and then starting my PhD program in Tropical Ecology here at UW. What advice would you give a young scientist? Be brave and bold! Never stop asking questions. Never be satisfied with “because that is the way it is.” Find a role model. Blaze your own path. Believe in yourself and the power of science.